If you have noisy lifters and their not actually chipped or broken the most likely reason that they are noisy is because they are not able to get oil into them to keep them at the correct clearances. If yours are anything like how mine were it’s no wonder why, years of dirt built up in them, and around them. This is from not regularly servicing the car and is keeping them from working properly. Here’s a pic of what I found when I took off my rocker cover. After either following the work shop manual or the changing lifters thread in this section here is the process I took to clean the lifters. Firstly thanks to VL BT1, I got an idea of how to do it, by using a small flat head screwdriver, you need to pry the small wire clip at the top of the lifter off, making sure you keep your hand over the top of it while you do it because the clip springs off in any direction and they’re not easy to find again (especially in the dirt). Pic of using screwdriver to remove wire clip. Once you’ve got the clip off the top section of the lifter just pulls out easily, this section has a fine oil hole in the top of it which is connected to the hole on the side, using something fine like a pin or a brooms bristle, you need to make sure this is clear of any dirt, I also used a compressor to blow any dirt out of this hole. Pic of top section and wire clip. You can then soak this section in some degreaser/petrol/diesel to clean the underside of it. The next part is the trickiest, getting the lower section out of the lifter body, it has a ball valve at the base of it and is pretty much held in by suction, because it is hard to get at with any tools as such I got a bent up a piece of coat hanger to pull the section out. Pic of lower section, spring and coat hanger hook. I used the air blower to blow air through the valve to push the lower section up and then use the hook by pushing it in and leaning it on an angle so the edge digs in to the side as you pull it up, also used the handle of some pliers to pull it out by just wedging it in there, this will take some time, it is the most frustrating part of the whole process, but it is possible. I just played around with different things, also pushed the ball valve with the pin, and oil squirted in my eye, didn’t really have a pattern at getting them out just had to keep at it. Pic of coat hanger hook in lower section. Once out there is a spring below it and that’s all the parts, so now you have the lifter body the wire clip, top section, lower section, and spring. Soak all the parts and using the screwdriver or equivalent scrape out all the dirt of the top and bottom sections. Using the pin make sure the ball valve is free of dirt on both sides of it; also use the blower to clear it. Clean the lifter body, spring and clip, dry all parts. Now you can reassemble the parts, the spring sits in position in the centre of the body, once located it doesn’t move, wipe some clean oil on the lower and upper sections, slide in the lower section with the ball valve side towards the spring, slide in the upper section with oil hole facing the top, putting on the wire clip I slid it on from the side and pushed it in using the screw driver, still making sure it doesn’t fling off somewhere. Now that they’re back together you need to prime them with some clean oil before putting them back into the lifter blocks. I got an ice cream container put them all in it and poured in oil so it covered them when they were standing upright. When in the oil I just pumped the top section, and you will notice air bubbles coming out of the hole on the side of the body. Keep doing this until they get hard to push down and most of the air bubbles have come out. Keep them upright in the oil until you are ready to reassemble back into the car. Pic of engine after everything all cleaned up and partly reassembled. Follow the workshop manual or the changing lifters technical article on reassembling the lifters into the car. After putting everything back together you need to run the engine for a few minutes until the ticking stops which means the lifters would be full with oil. It is suggested to 'run in' the lifters at 3000rpm for 10 minutes or so. I did this for a bit but they were still noisy so I then just went for a drive, just about five minutes worth, took it up to 100 km/h pulled over on the side of the road in a quite area, wound down the window and TA DA!! quiet. Now when I start the car no more of this waiting for it to warm up for the ticking to go away only for it to continue, just turn the key tick tick quiet aahhh. Please post up any other suggestions/tips Thanks. nice article mate! im sure this will help a lot of people out! so by cleaning it .. what is it going to gain ..
also when i start my car .. i am not sure but i think its the lifters that make noise ... well it just starts gows " tik tik tik tik tik tik ) after like .. 30 seconds it stops .. wile the engin is running ..
Last edited by SELO XST 045; 16-10-08 at 19:53.
so by cleaning it bro .. what is it going to gain ..
Last edited by SELO XST 045; 16-10-08 at 19:56. On a serious note though, I would actually use kero not petrol when cleaning them as kero is oil based & petrol will dry them out. Just soaking the lifters wouldn't of got the amount of crud out of the lifters i had, and by taking them apart it wouldn't matter if petrol would dry them out because when you reassemble them clean, you need to not only put clean oil on the parts as your putting them together, but once they are together you need to submerse them in clean oil and pump them to prime them with the fresh oil. Apart from the usual constant lifter noise all rb30s seem to have, i have a louder ticking noise that comes and goes at about 15 second intervals, it's louder than the rest of the lifters and seels to go away with revs. That cycling of the noise is what i had, now the only ticking is the injectors. But aren't there some kind of rubber seals/o-rings or something inside the lifters? From experience, soaking doesn't clean them out effectively it does remove most of the gunge in the upper part, however, it doesn't remove significant amounts from the lower section. I soaked a set and a half in a diesel / kero mix for 15 months (Ok I forgot that they were in the tin until I did a garage clean-up and was wondering what was heavy and rattling about in the liquid), blew them out with the compressor through the side hole, then just for kicks pulled them apart, the upper section was pretty damn good but the lower section (the bit below the sprung ball bearing, refer pic 8 above) was still full of crud. Soaking them did make them significantly easier to pull apart, the lower section of 15 of the 18 were able to be removed by blowing air straight at the ball bearing which depressed it, forced air under the lower section and popped it out the top. The other 3 I filled with acrylic thinners, depressed the ball bearing with a dart and got the thinners into the very bottom and 15 mins later they too were removed using compressed air. On Assembly, I put in the lower section by pushing it in with the ball bearing depressed using the dart, then filled the body of the lifter with oil, then depressed the ball bearing again to to get oil into and air out of the very bottom, then put the top half on, place in container of oil and pump it up bleed it etc. When all goes well it takes no more than 5 minutes to service each one, if it doesn't, well how long is a piece of string? great write up i will soon post pics of my old to rival yours for the world title of.... 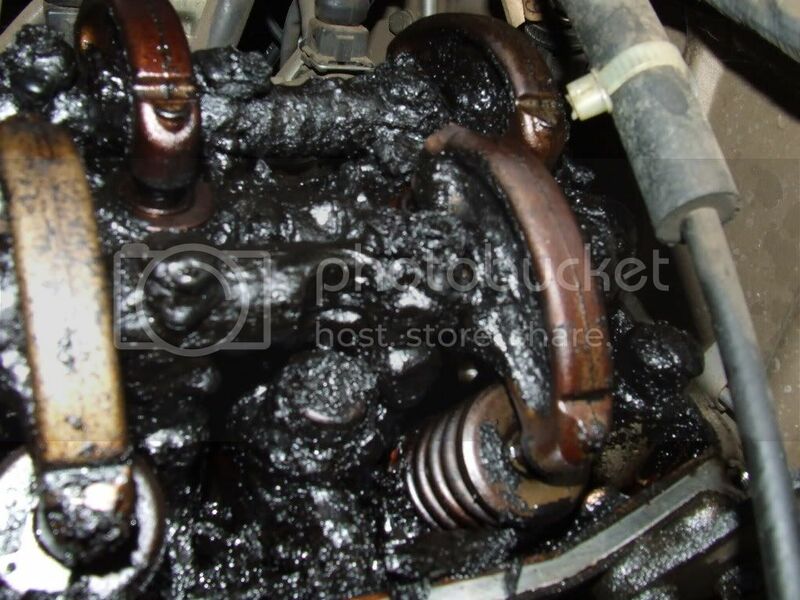 THIS CAR HAS NOT BEEN SERVICED AS REGULARLY AS REQUIRED !. lol will it beat this? I would add (as I am known to do) something more. not to mix them up and kept the set of bits together. an ultrasonic cleaning bath, hours in fact but they finally got cleaned. 3. Insert Screw extractor with rag into the lifter. Push in, twist and sorta flick it out. It seriously took me about a minute with each lifter like this. being masked by the resin buildup ! Whoah......I'm suprised that car even runs. Last edited by 5spdvl; 01-10-07 at 22:51.
just did this yesterday. not a sound from the lifters and runs a treat! although i did fling one of the U clips out and spent AGES trying to find it, went **** knows where so had to buy a full new lifter for $50 just to get another U clip... oh well $50 for a nice sounding engine is worth it i guess! yes there is plenty, but it was on a saturday afternoon and had to buy one new lifter from the only place that had one... repco... just for the farkin U clip. i wasnt going to go a sunday without my car. its crazy how much of a difference it makes. yeah pmac give it a go. if ya need a hand let me know, i'll come give what i got. haha. but anyone giving this a go should make sure you cover the U clip with a towel or something when doing it like said above. its not fun having done all the work takin it apart, then not being able to finish off cause of a little peice of damn metal. all good tho... cheers for the tech article! I'm having same problem with my lifters.....getting a VERY loud ticking noise, not just when starting the car, gets worse once the car warms up, even worse on hot days. Oil was changed about a month ago. Just wondering what oil people would suggest I use.